WWE Rumor Mill: Major changes to be made in the TLC match card? Will they clash at TLC? As per the rumor roundup on Cagesideseats.com, WrestleVotes had tweeted that they were expecting a change in the TLC match card to be made on RAW. Even still, there is high speculation about a possible change in Baron Corbin vs Braun Strowman match. There is also a chance that there might be some kind of a consolidation in the three matches which are part of Baron Corbin's ongoing storyline. Braun Strowman is set to go one on one against the man who cost him the Universal Championship at Crown Jewel -- Baron Corbin. However, Strowman had suffered an elbow injury a few weeks back on an episode of RAW which has put this match at risk, as it isn't certain if the Monster Among Men will be cleared to wrestle by TLC. The match between the two giants had a stipulation which stated that if Corbin losses the match he would be removed as acting GM of RAW whereas if he managed to win, he will become the permanent GM. 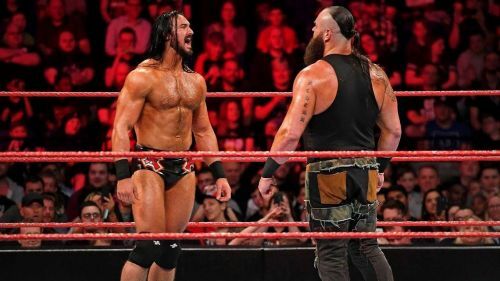 With Strowman's injury, it will be impossible for the former Tag Team Champion to have a competitive match; so it was being speculated that the match might end up being a squash match. However, it looks like new reports are suggesting that the match might just be clubbed with the other two matches which involve Corbin and his heel pack of Drew McIntyre and Bobby Lashley. The other two matches currently are Drew McIntyre vs Finn Balor and Bobby Lashley vs Elias. So, there is a good chance we might see a six-man tag team match instead. WWE TLC will take place on December 16, 2018, at the SAP Center in San Jose, California. Would you want to see a six-man Tag Team match or three one on one matches? Let us know in the comments!